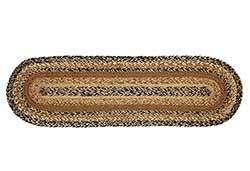 Braided Stair Treads, made of braided jute, available from India Home Fashions (IHF), VHC Brands/Nancy's Nook, and Earth Rugs. 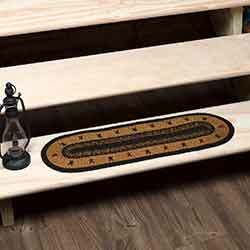 Affix to your stairs or use a small runner. 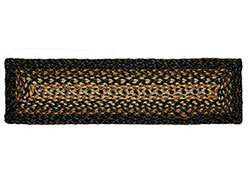 Brown, Black, and Charcoal Braided Jute Stair Tread, by Capitol Earth Rugs. Features a color palette of mainly black, tan, brown, and grey. This is for the Stair Tread, in the OVAL shape. Measures 27 x 8.25 inches. 100% dyed natural jute. Spot clean only. Burgundy and Tan Jute Stair Tread, by VHC Brands. Features a burgundy red and tan color scheme, with latex backing to help prevent slippage. 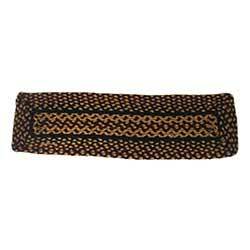 Burgundy and Tan Jute Rectangle Stair Tread, by VHC Brands. Features a burgundy red and tan color scheme and rectangle shape, with latex backing to help prevent slippage. Burgundy Braided Jute Stair Tread, by Capitol Earth Rugs. Features a palette of mainly burgundy and charcoal. This is for the Stair Tread, in the OVAL shape. Measures 27 x 8.25 inches. 100% dyed natural jute. Spot clean only. 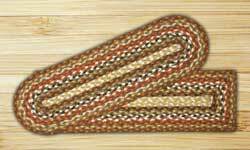 Burgundy, Gray, and Creme Braided Jute Stair Tread, by Capitol Earth Rugs. Features a color palette of barn red, grey, tan, and creme. This is for the Stair Tread, in the OVAL shape. Measures 27 x 8.25 inches. 100% dyed natural jute. Spot clean only. 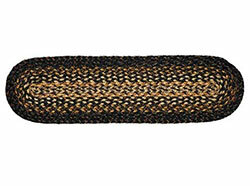 Carson Star Braided Stair Tread, Oval (with Latex), by Flooring. 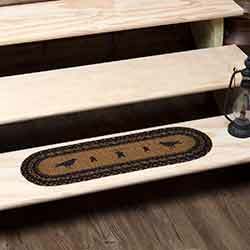 Carson Star Jute Stair Tread Oval is braided jute in black, burgundy and natural tones, with an array of stenciled 8-point stars around the perimeter. This version has a latex spray coating on the back to help with slippage. Coordinates with Carson Star bedding ensemble and window treatments. Cranberries Printed Stair Tread, by Capitol Earth Rugs. Artwork designed by Harry W. Smith. 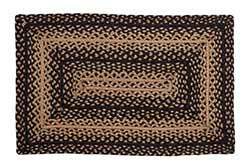 Can be attached to a stair or used as a small decorative tablerunner. 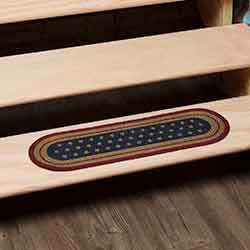 Cunningham Red Braided Stair Tread (with Latex Backing), by VHC Brands. 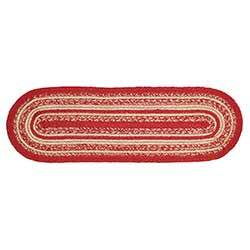 Add a touch of warmth to your home with these small red and tan braided runners, to be used on a shelf or stair. he Heritage Farms Star Jute Stair Tread Oval lifts its colors from the bedding set to complete a quietly primitive look throughout the entire house. Shamrock Braided Stair Tread, by Capitol Earth Rugs. Features stenciled shamrocks, great for your Celtic or St. Patrick's Day decor! Braiding coordinates with the Black, Mustard, & Cream rug collection. 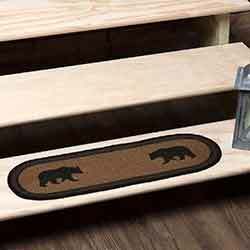 With its two facing black bears on a tan center, the unique Wyatt Bear Jute Stair Tread is an ideal addition to your rustic home.